Strolling around has never been easier with two children. The versatile Caboose Stand-On Tandem allows an older child to sit and stand on its patented rear platform/seat while a younger child rides comfortably in front. If the standing child tires, they can turn around and rest on the padded rear seat. Fully equipped with a universal car seat attachment system, the Caboose can accommodate an infant in the car seat so you can use it as soon as your new arrival comes. And parents make out too because the Caboose is lightweight and folds up compactly. It also has a large basket and storage pockets for everything you’ll need to take along with you. And the rear platform means no more lifting a heavier older child in and out of the stroller when they want to see or get tired. The Caboose Stand-On Tandem makes strolling two children a breeze! We love to take our kids out for new adventures frequently. So whether we are at the zoo, a museum, theme park, or sightseeing around the city we like to bring the stroller along in case one of our kiddo's gets tired of walking. The problem with a single stroller and two tired little one's often exists in which one actually gets to ride (one is always left walking while the other gets a break.....which can lead to a public display of tantrum's worthy of gawking from onlookers ;). Problem completely averted with the Caboose from Joovy! Frequent reader's know of my affinity for this family company that puts so much care into the design of their products (worthy endless praise...really!). I was so excited to have the chance to check out the Caboose! B is older so he of course loves to stand on the back (or take a seat on the rear seat) and hitch a ride down the long city streets (mommy would like to climb on some days;) and the princess loves her seat up front with all of it's shaded & padded comfort she's riding in style! 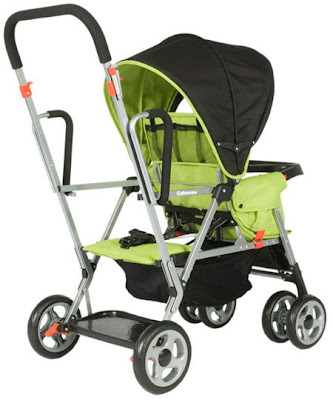 I have to note that this design is far more compact than other platform strollers that I've seen on the market. Dually noted; the steering couldn't be more perfect. No need to struggle in turning or maneuvering - it goes where you steer - it's that simple ( who wants to have to lift and manipulate a stroller with two kids in it?! Not this mom ;) As always Joovy has put the same care and consideration into the design of this AWESOME stroller! WIN IT: Experience the convenience and quality of the Joovy Caboose! 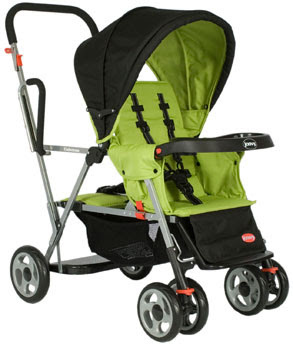 One Lucky Reader will receive the Joovy Caboose (In the Appletree Color Choice pictured Above)! HOW TO ENTER: Leave a comment~ In addition to the Joovy Caboose, which Joovy item would you love to have for your little one? The comment is considered your entry. I also would love to have the green nook. I love it it is amazing. Besides the stroller I would love the TOY CABOOSE which I know my little girl would just LOVE to have! Cool stroller! I also like their Play Yards! I would love to have the orange Nook highchair! We just spent the day at the local fair and I think we really needed a parent organizer. Wow that would have helped. i like their highchairs & love the kooper! I would love to have the Orangie Nook also. I'd like to have the Joovy Room2 Ultralight in my home! I liked Joovy's facebook page! I also love the Nook highchair. Blog Follower! And I'd LOVE to have the Ergo Caboose! (I'd got a young toddler & a baby on the way.. it would be well used).